CANTON, MA (June 1, 2015) – This summer, there’s a cool new way the cookie crumbles for Dunkin’ Donuts guests. 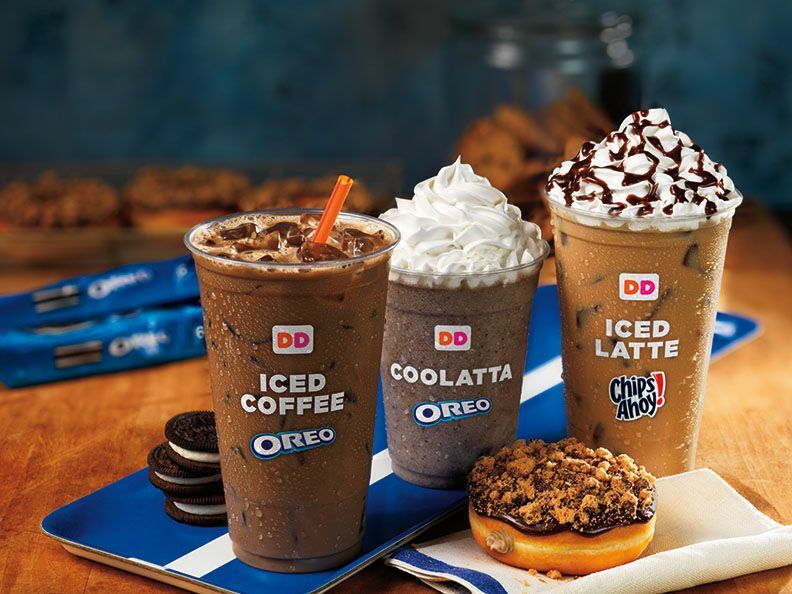 The brand has introduced a new food and beverage lineup featuring the classic flavors of OREO® and Chips Ahoy!®, available through summer at participating Dunkin’ Donuts restaurants nationwide. To celebrate these new beverages and treats, Dunkin’ Donuts is also giving fans the chance to win fun prizes by “dunkin’” a virtual OREO® or Chips Ahoy!® cookie with the Dunkin’ Donuts “Cookie Dunk Instant Win Game.” Beginning today and running through July 15, anyone can log onto CookieDunkGame.com online or via their mobile device, once per day, to play the cookie-themed game. Participants can drop an OREO® or Chips Ahoy!® cookie into a slot, and depending on where it falls, instantly win a $3 or $5 mGift, a JetBlue travel certificate, or entries into the Grand Prize Sweepstakes for four JetBlue travel certificates and a year’s worth of Dunkin’ Donuts Iced Coffee. For additional terms and conditions related to the Dunkin’ Donuts “Cookie Dunk Instant Win Game,” please visit CookieDunkGame.com. No purchase necessary, must be 18+ to enter. Void where prohibited. Dunkin' Donuts is the exclusive coffee provider of JetBlue, with Dunkin' Donuts coffee and tea served onboard all domestic JetBlue flights. Additionally, throughout the hot summer months of June and July, a special Dunkin’ Donuts sampling vehicle will be helping select cities cool off with the new OREO® and Chips Ahoy!® Flavored Iced Coffee and Coolatta beverages. Guests at each event will also be able to play a life-size “Cookie Dunk Instant Win Game” for the chance to win additional prizes. The tour will visit Hartford, New York City, Providence, Portland, Boston, Philadelphia, Baltimore, Washington D.C. and Albany. Mondelēz International, Inc. (NASDAQ: MDLZ) is a global snacking powerhouse, with 2014 revenue of $34 billion. Creating delicious moments of joy in 165 countries, Mondelēz International is a world leader in biscuits, chocolate, gum, candy, coffee and powdered beverages, with billion-dollar brands such as Oreo, LU and Nabisco biscuits; Cadbury, Cadbury Dairy Milk and Milka chocolate; Trident gum; Jacobs coffee and Tang powdered beverages. Mondelēz International is a proud member of the Standard and Poor’s 500, NASDAQ 100 and Dow Jones Sustainability Index. Visit www.mondelezinternational.com or follow us on Twitter at twitter.com/MDLZ.